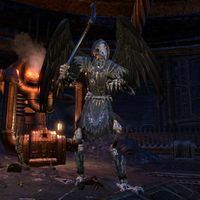 A Wraith-of-Crows (or Wraith of Crows) is an otherworldly creature composed of several daedric crow-like entities which create a semi-humanoid figure. It possesses both physical and magical attacks. One of them is summoned during Lost in the Gloam by the Shadow of Sotha Sil, and another is fought in the Mines of Khuras during Through a Veil Darkly. A number of generic wraiths are encountered in the Crystal Tower and Evergloam. Three unique Wraith-of-Crows can be found behind the portal at Exarchs' Egress. A Wraith-of-Crows polymorph was available for purchase in the Crown Store, although unlike Wraith-of-Crows NPCs the polymorph has no wings. The Wraith-of-Crows encountered during Through a Veil Darkly will yell out "Give me the Oracle, mortal flea! ", showing that they also have the ability to speak. They are technically considered NPCs, but while the lang file lists them as having no gender, in-game data says they are male. This page was last modified on 24 November 2018, at 19:21.